I'm not sure what the deal is with Alucard, He did the same thing in Castlevania Legends as well when he fought Sonia and I think that one happened before Castlevania III. You would think he would learn that when a belmont comes along it's best to just join them or let them pass. I love when bosses get a redesign because that is usually the number one thing Gamers complain about when playing a hack, That it is too much like the original. Making this one as different as possible is Excellent! Can you guys believe human is his 2nd form in this game? Or did you just happen to find him when he was in his 2nd form and human is his true form? If so why was he sitting around in his 2nd form? Hello Im new a member who just joined & Im happy that this rom hack is back & looking very lovely so far,also one question,will the other characters will have weapon upgrades just like Richter? Seriously though, I can't say enough how pumped I am about this. Good luck with that Chapel background, I feel like I probably worked on that for ever back then. What is a man? Baby don't hurt me, don't hurt me, no more. Here is the first one on the top of the list. I consider this one the hardest do to its size and how its split up. I am not a fan of Dracula's head being in the chest, If that could be turned into a chest that would be great. Now about the Skull this sprite is intact in the Abandoned Rom it just has to be moved and other stuff. I will attempt to look at that as well. It would be cool to convert the slime dripping out of the heads mouths and have it drip out of the eyes as blood. The main priority is the Giant Statue. There were animations for their weapons in the Beta. It's just a matter of getting them to work in the new project. There is Soooooooooooo much do to in this project, I am sure it will get looked at at some point. Here is a list of sprite hopes. New Fishmen, The ones from the abandoned rom don't work for some reason. I believe the programming got edited. Medusa Heads from Rondo Of Blood, Again extra programming was used. As far as bosses, Evil Grant needs to be converted into Evil Armand. Getting the HUD from the Abandoned Project in but with the Timer, Score Etc left in tact. Names of the stages....Not important but if possible, Why not? I'll see on what I can do with Dracula's final form. Its very limited in space compared to what Optomon and Dr. Mario were doing with their version and sadly I don't have the programming knowledge yet to make the room flip onto another bank or whatever is needed for it to feed off of another sprite and palette area for such a feat to come to fruition. I'll see on what can be done with the boss sprite once I get Medusa worked on as I put Richter's prayer and ending sprites to the side to work on these and by the way, I'm about 1/4 done with those. Was gonna go with a whip animation but forgot that one side of the prayer sprite while standing up 'fed' on the cape animation slots while the other remained unchanged so that was tossed out the window for something else lol. Note - The original mock ups are sometimes impossible to replicate. I will try to get the final product as close as possible. Note - Statues were originally Silver and not Gold but again the Mockups sometimes exceed the rules of the Nes Limits. This is looking damn awesome with each new screenshot I see,seriously I can't to play this game,also what's the next step after all the stages have been implemented? After the stages are done, probably sprite updating. reviewing the stages to make sure everything is where it belongs, Enemies and items. I have someone rewriting the prologue, a couple guys are designing sprites and graphics. After the game is 100% playable I am going to ask Optomon to install the soundtrack he made. Possible title screen remake, I am still trying to find the values for the intro screen Castle and convert it into the Konami Logo. Rewrite the epilogue scripts, rewrite the credits. (Adding all the contributors into the Credits) There are a lot to my surprise. At least 8 people at the moment. When I originally started this project it was intended to be an Uncensored Version of Castlevania III. I even stated that I didn't have the guts to try and continue where Dr. Mario and Optomon left off due to my lack in knowledge. But as I started trial and error, I learned the basics very quickly and all of a sudden the results were incredible. I had done it!....More or less, I don't think I will ever have the patients to draw sprites and graphics dot by dot...Way to overwhelming. Things are moving along fairly quickly, Once I design the blocks its just a matter of arranging them in a nice order. This is what i have done for now, I'll need to polish these up, and finish those 2 remaining and it's done. I think these are correct to NES limitations but I'll check on that as i finish with these 2. I hope these aren't bad. Sephirous, nice work on the chapel. Also, anyone knows if there is a way to upload my pics directly to this forum, that's usualy in ''atachments'' but not in here. Im glad to see that progress for this amazing rom hack is going very well,with multiple paths in the castle to end up on a different stage,beautiful sprites etc,I can't wait to play the final product,keep up the amazing work! It's a cool start. I'm probably going to remove the Chair Sprites all together so it doesn't clash with the stage redesign. So I will just need the Standing Sprite as well as his Attack Sprite. This will make it so Dracula Just Appears. Actually now that I am looking at those sprites, Those actually would make a better Alucard Boss Fight. If possible. The expression on his face in the standing position looks not as aggressive as Dracula's and by this game taking place after Symphony Of The Night Dracula would reference how he looked in Symphony Of The Night. I noticed that, I actually had another one but shading was looking good on one side, but wrong when mirrored. Is anyone working on Alucard at the time, if not I'll pick him up and use this head for him, as soon as I'm done with Dracula. I know Sinis is working on a couple sprites but as far as Alucard's Boss Sprite, I don't think so yet. Ok then, I think I might finish Dracula this weekend and Alucard through the course of the next week. Sorry for asking again but is there a way to upload my pics directly from my computer to this forum? Sadly I haven't had much time lately to work on sprites as I've been running around like a headless chicken doing stuff unexpectedly and will be for the next 3 or 4 days(?) though at least I found some time tonight to do sprites so here's a progress report lol. WOW! Those are looking awesome! If you can get the current Medusa you made to fit into the game then perfect! Yeah if Dracula gets to complicated to make then do whatever you need to. The Dracula from SOTN Richter battle is cool though you would probably have to create a Frontal Image of him facing the screen. The Skull was put into the game as a background image. 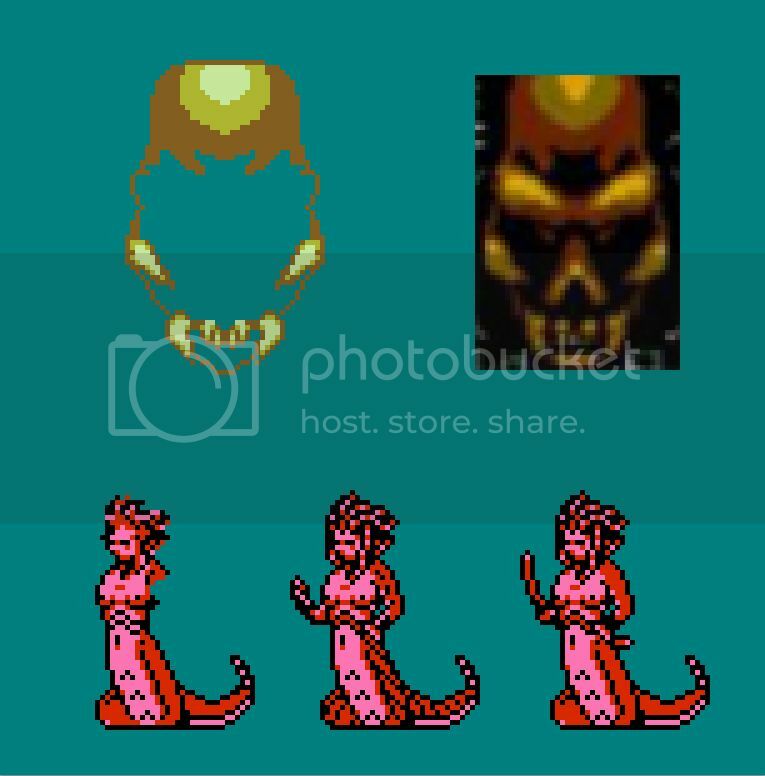 If this is helpful here, This is the Sprite Sheet where you can see at the bottom is the Skull Image. The only way that I usually upload images on here is to upload the image to a place like Photobucket and then copy the IMG Link to here. As far as Dracula's Sprite unfortunately that is a mockup image of what was going to be created. Dracula's sprite was never put into the game. The image on You Tube is an oversized Mockup. Meaning it is very possible to put him into the game but he will be smaller, Which is fine. He just looks big because of the way the image was drawn. Well hell. That goes to show that I can't remember anything. Okay, this will make it simpler lol. By the way, need to ask a question. Do you want me to make a damage look for it or was the plan still in effect to program that boss differently for the spittle stuff to drop out of the eyes only without a damaged look? If all else fails for the 3rd form I'll make a frontal view of it. Too bad we couldn't find someone to reprogram that boss into the version that Dr. Mario brought up for his end game look in SotN when Alucard faces him as I found that image by accident while looking for the reference stuff on the skull lol. No matter, I'll get to it later tonight unless I'm too damn tired from today. Rising up early to type this before I begin my daily routine again lol.